I use Grammarly's plagiarism checker online because I don't have eyes in the back of my head, despite what my kids think. Here’s a book that will see you giggling, snorting, clapping and dreaming about the food possibilities you could grow in your backyard. It’s called Backyard Bounty and is the second book by Janet Luke of Green Urban Living. In it, she sets herself the challenge of feeding her family off their suburban section for four months. Janet Luke is absolutely one of my favourite New Zealanders (who I’ve never met). She’s leading the charge in urban homesteading and has so much wisdom to share. She is also a guardian of our honey bees, and is fabulously innovative at turning waste products into useful, food-growing devices. I’m a subscriber to Janet’s Green Urban Living newsletter and have watched most of her wonderfully informative YouTube videos, but this is the first of her books I’ve read. Of course, now I want to read the rest. 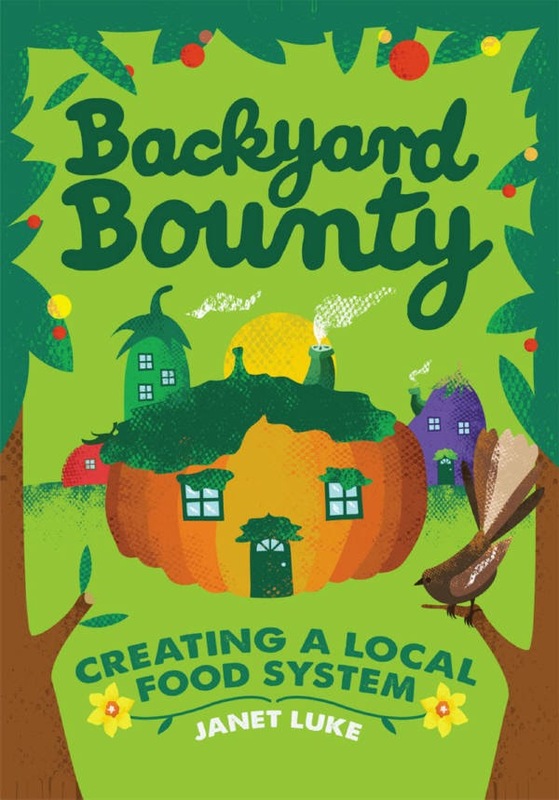 Backyard Bounty reads like a witty, yet inspiring and informative diary. I’m impressed with Janet's ingenuity and boldness: raising rabbits for meat; keeping dairy goats for milk and cheese; bee-keeping for honey; foraging for wild fruit, cooking garden snails for escargot; and building a hydroponics system to grow tomatoes. Things don’t always go to plan for Janet, but I applaud her efforts all the same and am glad to have gone along with her on the four-month vicarious ride. A nice touch is that she links the relevant YouTube videos at the end of each chapter. If you’ve got a touch screen phone, you can just swipe it over the image to bring up the video. Otherwise you can type in the YouTube link. It’s lovely to be able to see the rabbits, goats and gardens she talks about in her book. After finishing tell of her home adventure, Janet shares her vision for the future. She takes us on a stroll through her imagined community, where it’s the norm for neighbours to swap their homegrown bounty, where public areas are planted out in food-producing plants based on themes like soups and casseroles, and where waste-lands are converted into community gardens. Janet also writes about international communities where urban homesteading is accounting for more of the food production, out of necessity. For example, the economic recession hit the United State's Detroit hard. Because of business closures and high unemployment rates, Detroit has reallocated much of its urban landscape to food production. Janet points out that it shouldn’t take disaster to prompt action. New Zealanders could take proactive steps now to secure our local food sources. This would leave us better off should disaster should strike in the future. It would also reduce our reliance on fast diminishing oil-reserves. Immediately after finishing Backyard Bounty, I went out and bought two miniature fruit trees to plant in the garden of the house we’re renting. Even though it’s not my garden, I felt so inspired by Janet’s vision of urban gardening that I wanted to do something concrete to participate in her dream. I loved this book and would happily read it again, and again.